After examining eight brochures advertising caves in the Shenandoah Valley, I chose to tour the oldest show cave, the Grand Caverns, which is noted to have had guided tours led for more than 200 years. One of the early visitors was Thomas Jefferson. The Grand Caverns, near Staunton, Virginia, were rated by Parade magazine as the number two cave attraction in our country. The caverns was discovered in 1804 by a Bernard Weyers, and he opened it to tourists two years later making this the oldest operating show cave in the U.S. It was declared a National Landmark in 1973. The caverns with 56 degree yearly temperature is the perfect place to visit any time of the year. It would cool you on a hot day and warm you up on a cold winter day. I came in on very hot day in a tee shirt but after walking a short distance in the cave, I found a sweatshirt I was carrying felt good. Mostly there were large rooms and high ceilings, but a few low ceilings, one on which I bumped by head. On some tight places our group of 20 needed to walk single file, and some of the heavy among us just squeezed through. In places water dripped slowly from the roof creating over ages of time the stalactites and stalagmites. The most beautiful spot was created with the use of colored lights in the Rainbow Room that gave us a sense of seeing a beautiful city lit up at night. In one of the large rooms dances had been held in the early days, and the rule according to the guide was that each man was to bring two women with him. A stalagmite in the middle of the room was used by a woman when she wanted to dance by standing by it and passing her hand over it. The rocks in the cavern are constantly growing and we were warned not to touch anything because a single touch could possibly stop the growth process. Regular tours were run on the hour, and our group of 20 passed the group before us coming out, but suddenly we found ourselves being passed by a large group of children who were having a separate tour. Near the exit our guide pointed out over 200 signatures of both Union and Confederate soldiers who had been in battles here during the Civil War. We were warned not to touch since they are so fragile. You can’t take a cave tour without your guide turning out all of the lights so we can experience complete darkness, a rarity. The last cave we had visited the darkness wasn’t complete because of cell phones and watches. Here we experienced complete blackness along with a story of how early visitors using candles had hit a mystic area where the candles went out and they had to find their way out in complete blackness, a difficult task given the various byways. Grand Caverns offers a breathtaking panorama of subterranean beauty! on various physical aspects, such as room size, paths, ratio of growing formations to dormant formations as well as overall beauty. In addition the waiting area has a variety of educational displays that added to what our guide had told us. There I learned more about bats, cave creatures, how limestone forms caves and the early uses of caves by humans. Traveling to some museums broadens our minds as we learn how some of our leaders focused on making needed changes. The museum tour started with a movie that viewed his life, starting with his childhood in Pennsylvania. A graduate of the Virginia Military Institute, he was able to become the leader of the many great generals who had graduated from West Point, such as Dwight Eisenhower, Douglas MacArthur, Omar Bradley, and George S. Patton. Besides not being a fellow West Point graduate, Marshall also did not have battle experience. However, he seemed always to be preparing men for battle, but instead of focusing mainly on mistakes on our last wars, he was different in that he was preparing men for modern wars based on what new equipment had appeared and better ways to handle problems that were apparent in some other countries. President Franklin Roosevelt appointed him as his deputy army chief of staff in 1938 to help prepare an army that was 17th in the world in terms of numbers and modernization to be able to fight in the coming war. One of Marshall’s strengths was his outspokenness that may have made Roosevelt cringe, but also brought him around to understanding what real needs of the military were. Marshall understood the need to prepare men to use modern equipment. Without his insights, we would have been totally unprepared for our entry into WWII. After the war Marshall recognized that we had made many mistakes after WWI that had led to the rise of Hitler and continuing tension between the European countries. He did not want this to happen again and pushed for the Marshall Plan that would help with the rehabilitation of all of the countries outside of the Iron Curtain. This was endorsed by President Harry Truman and is considered by many as the salvation of Europe with provisions of equipment, machinery for rebuilding and food supplies to prevent starvation. For this Marshall later was given the Nobel Peace Prize. Four rooms of exhibits and two long hallways have pictures, large posters, magazine covers and some equipment like small arms and a jeep from WWII, to give us a sense of his life. The largest room covers his childhood and his time at college and in WWII. Another room is on the Marshall Plan and the Nobel Peace Prize, and a third room has his office equipment and role as Chief of Staff. In the lower gallery in the meeting room a continuous running film is part of the series that Marshall had professionally made on the reason we were fighting the war. This was shown only to military personal to prepare them emotionally and mentally for the enemy they would encounter. It shows the atrocities committed by our enemies upon the peoples they were dealing with. It was somewhat like the pep talks coaches give their teams to get them ready for important games. Marshall was one of the greats of history and it is possible that without his ability to anticipate what was needed to fight World War II and the help he provided for the opponents to recover, this would be a very different, and much more vicious and dangerous world. I have been entertained recently with how modern science is changing what we know of history, even history from 3500 years ago. 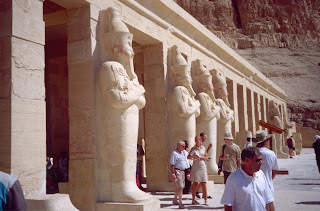 A case in point is what has been learned about Hatshepsut, the woman Pharaoh whose rule resulted in the construction of many major structures that I explored in a cruise along the Nile and in a visit to the Valley of the Kings in 2002 . At about 440-feet-long and 97-feet-high the most impressive is her funerary temple called "Djeser Djeseru" or "Holy of Holies." Her reign had been a peaceful one of 22 years. Our guide pointed out that references and facial features of Hatshepsut had been chiseled from the wall and statures by Thutmose III, who had hated her and wanted her eradicated from history. After her death he seceded her, went to war and doubled the size of the kingdom. Her mummy had vanished from her tomb that was 35 stories deep in the Valley of the Kings, and that seemed to be the end of what we could know about her. A few days later when I visited the Cairo Museum, the most important mummies were being kept under ideal condition to avoid further decay, therefore unavailable for public viewing. 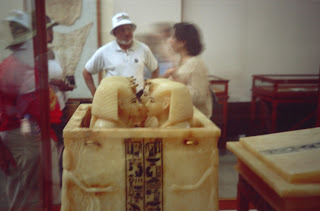 In 2007 Zahi Hawass, from the Cairo Museum, and his team undertook the task of finding Hatshepsut's mummy. They found they had eight unidentified female mummies who might be Hatshepsut, one of whom had been found in her nurse's sarcophagus. A number of approaches using modern techniques were used. DNA failed making the identification for lack of enough material. The bodies of known relatives were put through cat scans for clues. Three cat scans were borrowed from Germany that allowed the researchers to get 3D figures of her father, her brother and a stepson, that were then combined for a composite image. That allowed them to discard some of the mummies. In 2010 I had been at the British Museum when they were exploring the first mummy to undergo the virtual unwrapping using a CT scanner. In the display room the mummy's image was floating in the air in gross non-living color. What was his age? How did he die? Had he any injuries? A multitude of facts about the mummy were discovered. Basically it was a learning experience about some new technology that were being used. Then recently I have found on YouTube and other computer sources a much fuller explanation of what happened to Hatshepsut. Being able to tell how a person died turned out to be critical in identifying her body. Of the two bodies that were still in question, one of them had died of a jaw infection that had made it impossible for her to eat. Some dentistry had been performed, and a upper molar taken out leaving a root behind. When a person was made into a mummy, internal organs were taken out and placed in a separate small box, usually made of wood and ivory. Such a box was found with Hatshepsut's name on it. In the box were a liver, intestines and a upper molar with just one root. The tooth had the same density, size and fit into the space in the mummy's jaw with the one root. 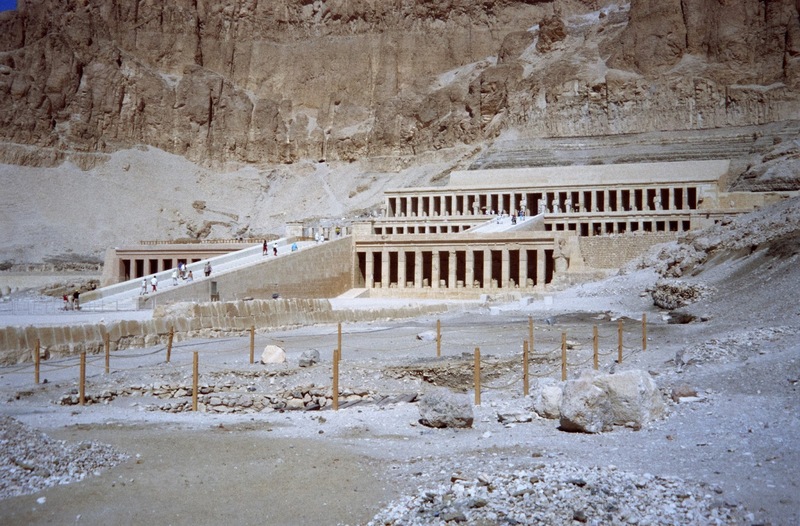 The team concluded that the forgotten mummy was Hatshepsut's. The research also meant that Thutmose III had not had her killed as originally thought. In addition it was found that he had not destroyed her images until many years later. It was believed that Thutmose did it to insure the smooth succession of his son Thutmose IV and to insure his family would take credit for the history she had left behind. 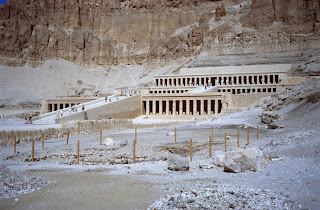 Since my visit in 2002, other relics of Hatshepsut have been found including buried images and stories about her accomplishments. She is no longer dead to history because of the advances that have been made in science. A box similar to the one where Hatshepsut's liver, intestines and a upper molar were found.